There is a lot of memorable international front-page newspaper reaction today to the 2016 U.S. election. Including, from south of a border that may soon be demarcated by a new wall, one of the most pointed and succinct headlines of all. 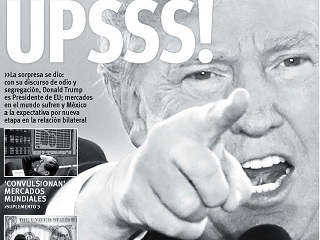 “Upsss!” is an emphatic version of the Mexican slang for “Oops!” While much will be written in the coming days and weeks about how this historic “Oops!” came to be, Karl Rove last night on Fox News had an interesting related observation. Love Rove or hate him, he turned out to be the perfect panel expert for last night’s tumultuous election events. When Fox News Channel election coverage co-anchor Chris Wallace asked Rove if there was any precedent on the Republican side for someone like Trump, with zero political experience and military service, getting to the White House, Rove replied that he could only think of the brief thoughts P.T. Barnum had of running for president. Barnum served in the Connecticut state legislature as a Republican in 1865-66. Some 15 years after he was involved in a hoax about a weed that could turn black people into white. P.S. Be sure to also note the exclamatory headline on the bottom left-hand corner of the Vanguardia front page. It encapsulates what is undoubtedly another popular sentiment today in Mexico about the U.S. election results.